This week I decided to help you make some space in your home in five easy, painless steps. No hard decisions to make! No rearranging the whole room! Five things you can toss out right now! 1) Expired food. There's an expiration date for a reason. Once you've cleared out the old food, you can see what holes you need to fill in your pantry. Read more on organizing your grocery shopping and kitchen here. 2) Expired beauty products. Many beauty products don't have expiration dates on them. For those that don't, you can find out how long it's safe to keep open beauty products here. 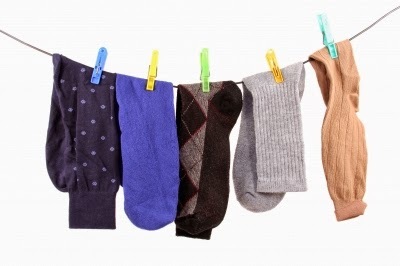 the sock isn't in the machine, the hamper or where ever you store your socks, it's probably gone. Let the singles go into a fabric donation bag or reuse (cleaning rags or sock puppets come to mind!). 4) Old newspapers, magazines & catalogs. How long have they been sitting there? When's the last time you actually looked at them? Let me rephrase: When's the last time you actually had time to look at them? If there's something in that stack that's really important, clip the single article. Otherwise, you can always get the information online and/or at the local library. 5) Broken toys. Tiny pieces and parts seem to fall off on a regular basis. Unless it's a super special toy, and easily repairable, I suggest chucking it. Replacements can be purchases if it's important, but beyond repair. Otherwise, chances are there are still other toys around.